832 pages is a lot of reading in anyone’s language. 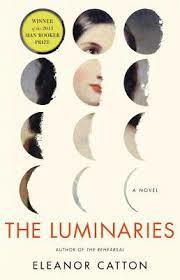 I have been busy reading The Luminaries every chance I could to avoid a hefty overdue fine at the library. I thought that I had succeeded in avoiding reading any reviews of it before I finished, but there was one that did get through my defences: Jane Sullivan’s review in The Age a fortnight ago. That’s one of the main objections to the book: that it’s too long. Others, variously, are that it shouldn’t be written in ponderous Victorian style; that it has too many characters and we don’t care about them; that the astrology framework doesn’t enhance it; and that the story, clever as it is, doesn’t add up to anything much. Well, that’ s pretty much written my review for me. I was reminded many times of Wilkie Collins’ The Woman in White while I was reading this book. Both are long; both are mysteries; both are about switched identities, and both involve deception for financial gain. But the difference is that The Woman in White was highly original at the time, and is today viewed by many as the first mystery novel, and the first and finest ‘sensation’ novel. What a gulf there is between being the first and being merely a pastiche. For Victorian pastiche this is, complete with convoluted (but always well controlled) sentences, the summary at the beginning of each chapter, and the opening scenes on a dark and stormy night. As in most Victorian novels conceived in the serial format of a periodical (think Dickens, Collins…), there is a huge cast of characters who swarm in and out of view, with false starts and red herrings, and the need for the author to draw breath and offer the occasional recap to the bemused reader lest everything threaten to spiral out of control. I find myself admiring many things about the book. Her characterization is excellent, and I found myself becoming engaged by each vignette as actors gravitated around one another. Her characters are complex beings, each with a back story, dreams and regrets. The conversation is pitch-perfect. Her description of place is excellent, too. You could see, hear and smell Hokitika, and as an historian of 19th century colonial towns (ah, always an historian!) it rang true in every regard- not a single false note. The plotting is painstaking and detailed as well. So many characters, so many intersecting motivations and lifestories. And her control of time is impressive too. The first long chapter starts on a particular day, the second less-long chapter jumps ahead slightly, etc. etc. with occasional chapters jumping back a year or more as the book progresses until it ends up on the day with which it opened. Each chapter gets shorter and shorter- somehow mirroring the astrological schema that runs through the book. But, but, but… how to put it all these vignettes together? How did this story fit in with that story? Who is this character again? Had I forgotten this bit of information, or has she only divulged it now, half way through the chapter? I don’t understand the overarching conceit of the astrological chart that she has superimposed over the story. It was not explained and, to my way of thinking, is not necessary either. I think that, in spite of my admiration for the parts, I begrudge the length of the whole. As others have mentioned, the action of the book really picks up at about page 575. Page 575? What an act of faith in one’s readers and confidence in one’s abilities as a writer to hold out for so long! And at the end of it all, the actors take their bow, but it doesn’t really mean anything. When I finished reading War and Peace, I couldn’t read another fiction book for days. I felt the same way about Hilary Mantel’s Cromwell books ( here and here) that preceded this book as Booker Prize winners. With these books, I had been transported to another world and whatever book I read immediately after would be diminished after I had been immersed so thoroughly by these big, ambitious books. After reading The Luminaries I feel rather short-changed. I put so much time into something that, despite its technical brilliance, has very little at its core. Sue at Whispering Gums was reading it at much the same time and beat me to the end. In spite of some ambivalence, the depth of Catton’s characterization won her over. Lisa at ANZLitLovers was underwhelmed. The Guardian review by Kirsty Gunn makes similar observations to what I have written above, but sees that as part of the book’s artistry and brilliance. I’m not convinced. Read because: it was sitting all shiny and new on the ‘New Books’ shelf and because I knew that it had won the Booker. In other years I’ve tried to read the shortlist before the announcement but The Thesis got in the way this year- so straight to the winner this time. You finished! I think it’s well worth reading, if only because there’s a lot of conversation going on out there about it. Like you, I didn’t read reviews before I read it and wrote mine, though I did see the first line or two of Lisa’s come through when she posted it. I’ve drafted a second post, to go live tomorrow, though it still doesn’t fully grasp the book the way I would like. I think it is more than pastiche. I think the structure probably does have something to say, but I don’t think it’s easily apparent. It was reading, reading, reading before, and now it’s thinking, thinking, thinking! Yes, when you’re reading in a hurry you don’t really have time to think about it. (you were reading quickly for a bookgroup discussion; I was reading quickly because I couldn’t renew my loan because it had holds). Then, if you start to read another book straight away, you forget the earlier one! (oh dear). To be honest, I’ve already forgotten the intricacies of the plot (if I ever really understood them). I’m left with an impression about technique, but not story. Yes, and that’s a bit of a concern I have about my reading. On the other hand I felt that if I didn’t keep pushing on I would lose it. I do think there’s some interesting stuff there, but I didn’t feel WOW at the end. However, when I look at my notes, I think, hmm … that’s interesting, and that’s interesting, but how do I bring it together in my head? What to say? It seems that all of us find it a bit wanting. Maybe it’s because the Mantel books have set such a high standard. Like you I was hesitant to start reading something else after finishing them because I had been so deeply absorbed in their worlds. But with The Luminaries I couldn’t wait to finish it so that I could read something else! I’ve been starting to wonder who has done a good job of replicating Victorian fiction in the 21st Century. I read Elizabeth Gilbert’s ‘The Signature of All Things’ and while the actual prose was flawless & a delight to read, the entire book was unmemorable aside from a handful of scenes. But then there are novels such as Michelle de Krester’s ‘Questions of Travel’ which I thought had a very 19th C sensibility, despite being such a contemporary novel. However I think I need to increase my sample size before I start making any sweeping judgements about 19th C historical fiction! 832 pages is a very big ask indeed. I’ve looked at the size of it, and picked it up in shops, fondled it a bit. I would find 832 pages difficult to read at any time, but I suspect that this year will be more difficult than many and I won’t get near cracking the spine. Perhaps it’s one of those books that I can leave to my dotage? Although perhaps I shouldn’t leave all the big ones til then- that would get rather wearing. I’m sorry you found it lacking, it still does sound interesting.